URKUND is an online text-matching tool which is available to students and staff of Dublin Business School as part of an overall institutional strategy to educate students about academic integrity. You will be provided with two opportunities to submit your assignments via URKUND prior to a third and final submission. A text-matching report will be generated which identifies matched text. Use this report as an opportunity to revise your work to avoid and educate yourself about plagiarism. 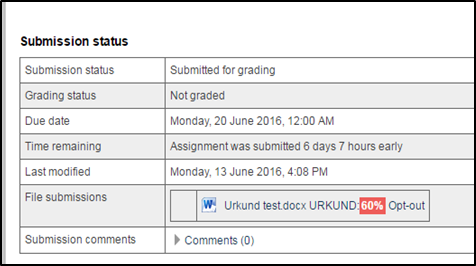 Urkund is available via the assignment drop-box on the module pages on Moodle. What size file can I submit? Moodle Assignment has an upper limit of 60MB. Urkund will not process files with under 430 characters. What types of files does Urkund accept? Urkund accepts files in the following formats: .doc, .docx, .sxw, .ppt, .pptx, .pdf (unprotected), .txt, .rtf, .html, .htm, .wps and .odt. Where do I submit to Urkund? Submit your assignment as normal via Moodle. Choose Add submission and upload the document from your own files. Moodle will send your submission to Urkund. Urkund is a teaching tool for students. Use Urkund to submit drafts of your work in advance of final submission. If Urkund indicates that the submitted work matches other sources to a high degree, please consult library referencing and assignment writing guides. Upload the file through Moodle as normal. After receiving the Urkund report, you can edit your work by selecting ‘edit submission’ and then re-upload the document. Once you are satisfied with your document you can send for marking by selecting ‘submit assignment’, this is the copy the lecturer will receive. ​Urkund normally takes 1 hour to generate a report, however at busy times this can take at least 24 hours. When submitting drafts you should allow plenty of time before your assignment deadline in order to receive the draft’s report. You will receive an email from Urkund (to your student email address) as soon as you submit. Tip: Please note that that if you include the coversheet, Urkund will text-matched the coversheet to 100%. You will be notified by email that your report is ready to be viewed. You can also check the submission status of the uploaded document on Moodle. In the example below the report is ready for viewing. Urkund uses a traffic light system when displaying matching similarity. Green and yellow indicate either little or no matched text. In these circumstances matched text is very likely due to references, questions and cover sheets being the same. When the colours are orange, red or black, further investigation is recommended. You will know that the report is ready for viewing when the similarity percentage is displayed. Click on the URKUND link next to the % to see the Urkund report.